It's chime to start making music. LDS Primary songs are one of the best ways to teach your children simple gospel truths about who they are and who they can become. They are also beautifully arranged and tailored just for kids. 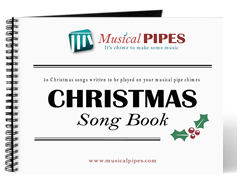 Your children will love to chime out the melody of familiar primary songs and even sing along as they make their own music. 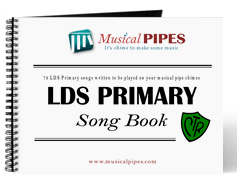 If you are unfamiliar with a specific song, you can play and listen to it here.Browse through our large list of free LDS Primary pipe chime music or purchase your very own LDS Primary pipe chime PDF music book for only $4.00 or a printed music book for only $10.00. 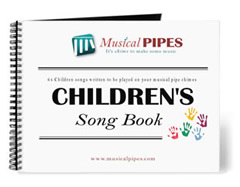 Whichever you choose, we hope you enjoy these 79 popular Primary pipe chime songs. Starting at $30.00 - Buy Now! Play your pipe chimes all year long! Playing musical pipe chimes is so easy that if you can hum a tune, you can play them. You don't even need to know how to read music - just hit your chime when it's your turn. You'll have a blast making music with this simple instrument. Great for all ages (~3 years and up).